Two days out from her history making date with destiny, India’s Mars Orbiter Mission (MOM) successfully completed a crucial test firing of the spacecraft’s main liquid engine to confirm its operational readiness for the critical Mars Orbital Insertion (MOI) engine firing on Wednesday morning Sept. 24 IST (Tuesday evening Sept. 23 EDT). Engineers at the Indian Space Research Organization (ISRO) which designed and developed MOM successfully fired the probes 440 Newton Liquid Apogee Motor (LAM) earlier today, Sept. 22, 2014, for a duration of 3.968 seconds at 1430 hrs IST (Indian Standard Time), according to today’s announcement from ISRO. MOM counts as India’s first interplanetary voyager and the nation’s first manmade object to orbit the 4th rock from our Sun – if all goes well. Today’s operation verified that LAM is fully operational to perform the do-or-die MOI braking burn on Sept. 24 targeted for 07:17:32 hrs IST (Sept. 23, 9:47:32 p.m. EDT) that will place the probe into a highly elliptical 377 km x 80,000 km orbit around the Red Planet. The burn was also marks the spacecraft’s final Trajectory Correction Maneuver known as TCM-4 and changed its velocity by 2.18 meters/second. “The trajectory has been corrected,” said ISRO. The $69 Million probe is being continuously monitored by the Indian Deep Space Network (IDSN) and NASA JPL’s Deep Space Network (DSN) to maintain its course. ISRO space engineers are taking care to precisely navigate MOM to keep it on course during its long heliocentric trajectory from Earth to Mars through a series of in flight Trajectory Correction Maneuvers (TCMs). On “D-Day” as ISRO calls it, the LAM and the eight smaller 22 Newton liquid fueled engines are scheduled to fire for a duration of about 24 minutes. The MOI braking burn will be carried out fully autonomously since MOM will be eclipsed by Mars due to the Sun-Earth-Mars geometry about five minutes prior to initiation of the engine firing. Round trip radio signals communicating with MOM now take some 21 minutes. The 1,350 kilogram (2,980 pound) probe has been streaking through space for over ten months. MOM follows hot on the heels of NASA’s MAVEN spacecraft which successfully achieved Red Planet orbit less than a day ago on Sunday, Sept. 22, 2014. “We wish a successful MOI for MOM,” said Bruce Jakosky, MAVEN principal investigator with the Laboratory for Atmospheric and Space Physics at the University of Colorado, Boulder (CU/LASP) at MAVEN’s post MOI briefing earlier today. MOM was launched on Nov. 5, 2013 from India’s spaceport at the Satish Dhawan Space Centre, Sriharikota, atop the nation’s indigenous four stage Polar Satellite Launch Vehicle (PSLV) which placed the probe into its initial Earth parking orbit. The probe is equipped with five indigenous instruments to conduct meaningful science – including a tri-color imager (MCC) and a methane gas sniffer (MSM) to study the Red Planet’s atmosphere, morphology, mineralogy and surface features. Methane on Earth originates from both geological and biological sources – and could be a potential marker for the existence of Martian microbes. Both MAVEN’s and MOM’s goal is to study the Martian atmosphere , unlock the mysteries of its current atmosphere and determine how, why and when the atmosphere and liquid water was lost – and how this transformed Mars’ climate into its cold, desiccated state of today. Stay tuned here for Ken’s continuing MOM, MAVEN, Rosetta, Opportunity, Curiosity, Mars rover and more Earth and planetary science and human spaceflight news. 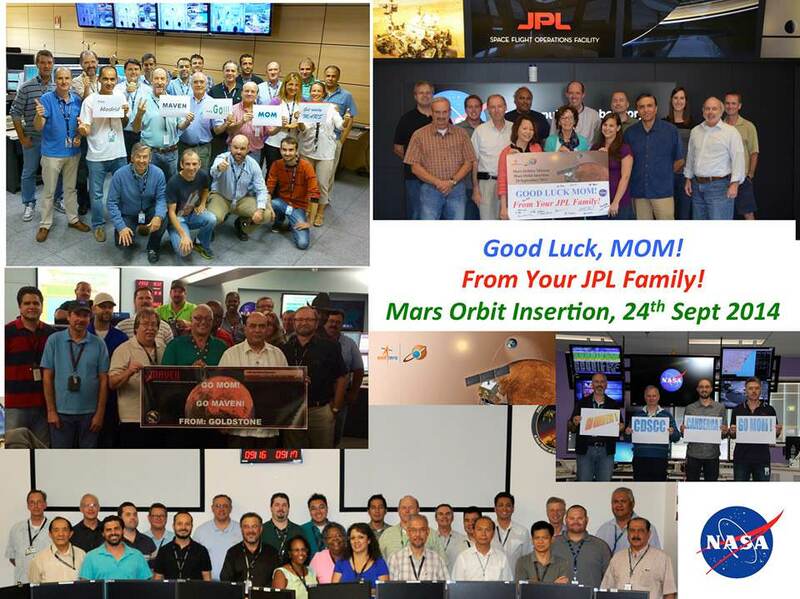 Now less than 25 days from her history making rendezvous with the Red Planet and the critical Mars Orbital Insertion (MOI) engine firing, India’s MOM is in good health! The Mars Orbiter Mission, or MOM, counts as India’s first interplanetary voyager and the nation’s first manmade object to orbit the 4th rock from our Sun on September 24, 2014 – if all goes well. MOM was designed and developed by the Indian Space Research Organization (ISRO). “MOM and its payloads are in good health,” reports ISRO in a new update. As of today, Aug. 31, MOM has traveled a total distance of over 622 million km in its heliocentric arc towards Mars, says ISRO. It is currently 199 million km away from Earth. Altogether the probe has completed over 90% of the journey to Mars. The 1,350 kilogram (2,980 pound) probe has been streaking through space for nearly ten months. To remain healthy and accomplish her science mission ahead, the spacecraft must fire the 440 Newton liquid fueled main engine to brake into orbit around the Red Planet on September 24, 2014 – where she will study the atmosphere and sniff for signals of methane. The do or die MOI burn on September 24, 2014 places MOM into an 377 km x 80,000 km elliptical orbit around Mars. MOM is streaking to Mars along with NASA’s MAVEN orbiter, which arrives a few days earlier on September 21, 2014. India’s inaugural voyager to the Red Planet, the Mars Orbiter Mission or MOM, has just celebrated 100 days and 100 million kilometers out from Mars on June 16, until the crucial Mars Orbital Insertion (MOI) engine firing that will culminate in a historic rendezvous on September 24, 2014. MOM is cruising right behind NASA’s MAVEN orbiter which celebrated 100 days out from Mars on Friday the 13th of June. MAVEN arrives about 48 hours ahead of MOM on September 21, 2014. Working together, MOM and MAVEN will revolutionize our understanding of Mars atmosphere, dramatic climatic history and potential for habitability. But before reaching Mars, mission navigators must keep the craft meticulously on course on its heliocentric trajectory from Earth to Mars through a series of in flight Trajectory Correction Maneuvers (TMSs). The second TCM was just successfully performed on June 11 by firing the spacecraft’s 22 Newton thrusters for a duration of 16 seconds. TCM-1 was conducted on December 11, 2013 by firing the 22 Newton Thrusters for 40.5 seconds. Two additional TCM firings are planned in August and September 2014. To date the probe has flown about 70% of the way to Mars, traveling about 466 million kilometers out of a total of 680 million kilometers (400 million miles) overall, with about 95 days to go. One way radio signals to Earth take approximately 340 seconds. MOM reached the halfway mark to Mars on April 9, 2014. MOM conducts Trajectory Correction Manoeuver (TCM) in Baiju Raj’s imagination. ISRO reports the spacecraft and its five science instruments are healthy. It is being continuously monitored by the Indian Deep Space Network (IDSN) and NASA JPL’s Deep Space Network (DSN). MOM’s journey began with a picture perfect blast off on Nov. 5, 2013 from India’s spaceport at the Satish Dhawan Space Centre, Sriharikota, atop the nations indigenous four stage Polar Satellite Launch Vehicle (PSLV) which placed the probe into its initial Earth parking orbit. A series of six subsequent orbit raising maneuvers ultimately culminated with a liquid fueled main engine firing on Dec. 1, 2013 for the Trans Mars Injection(TMI) maneuver that successfully placed MOM on a heliocentric elliptical trajectory to the Red Planet. Together, MOM and MAVEN will fortify Earth’s invasion fleet at Mars. They join 3 current orbiters from NASA and ESA as well as NASA’s pair of sister surface rovers Curiosity and Opportunity. Although they were developed independently and have different suites of scientific instruments, the MAVEN and MOM science teams will “work together” to unlock the secrets of Mars atmosphere and climate history, MAVEN’s top scientist told Universe Today. “We have had some discussions with their science team, and there are some overlapping objectives,” Bruce Jakosky told me. Jakosky is MAVEN’s principal Investigator from the University of Colorado at Boulder. “At the point where we [MAVEN and MOM] are both in orbit collecting data we do plan to collaborate and work together with the data jointly,” Jakosky said. Learn more about NASA’s Mars missions, upcoming sounding rocket and Orbital Sciences Antares ISS launch from NASA Wallops, VA in July and more about SpaceX, Boeing and commercial space and more at Ken’s upcoming presentations.